Today, on February 3, in the Church of St. Sophia in Kyiv, the enthronement of the Primate of the Orthodox Church of Ukraine, Metropolitan Epifaniy (Dumenko) took place. The official representative of the Ecumenical Patriarch – Metropolitan Emmanuel of France, as well as representatives of the monasteries of Mount Athos, have arrived in Ukraine to attend this solemn event. The bishops of the UOC US, UOC of Canada and and the Exarch of Patriarch Bartholomew in Kyiv have taken part in the enthronement ceremony. In concelebration with the priests of the OCU and the Constantinople Patriarchate, Metropolitan Epifaniy celebrated the Divine Liturgy. The ceremony of enthronement took place in the altar part of the church before the Gospel reading. Metropolitan Epifany was elevated to the throne by a senior hierarch. He was presented with a cross and two panagias – external signs of his primate’s ministry – following which Metropolitan Epifany officially became the Primate of the OCU. Due to scheduled health-related procedures, Honorable Patriarch Filaret could not take part in the celebrations. The doctors forbade him to leave the hospital, and therefore Bishop Filaret sent his greetings to the Primate. After the Divine Liturgy, Metropolitan Dymytriy (Rudyuk) of Lviv and Sokal and the representative of the Constantinople Patriarchate, Metropolitan Emanuel of France, congratulated the Head of the OCU and handed him a metropolitan’s crosier. Thereafter, President Poroshenko addressed the Head of the OCU. He noted that after the enthronement, the Church and Ukraine received a new leader, with whom many people associate their hopes. Poroshenko also mentioned all those who made this solemn day come: Patriarch Bartholomew and Ukrainian hierarchs Filaret, Makariy, and Simeon. The head of the OCU expressed hope that over time, the Church he heads would receive the status of the Patriarchate and unite all Orthodox Ukrainians. “The doors of our churches are open to everyone,” the Primate emphasized. Representatives of other Ukrainian Churches, in particular Patriarch Svyatoslav (Shevchuk) of the Ukrainian Greek Catholic Church, the Chairman of the Conference of the Roman Catholic Bishops Bronislav (Bernatsky), Metropolitan Mecislav Mokrzytski of Lviv, Roman Catholic Church in Ukraine, and representatives of Protestant Churches came to St Sophia to extend greetings to Metropolitan Epifaniy. 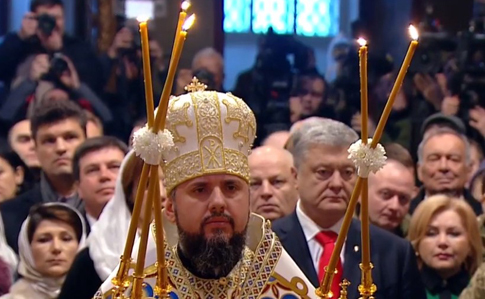 President of Ukraine Petro Poroshenko and his wife, representatives of government, public organizations, diplomats also attended the Liturgy and the enthronement ceremony. Metropolitan Epifany of the OCU became the youngest Primate in the Orthodox world. Today he is exactly 40 years old. As RISU has reported, on December 15, the unification council took place in Kyiv, where its members created the Orthodox Church of Ukraine and elected Metropolitan Epifaniy (Dumenko) as its head. On January 6, the Ecumenical Patriarch solemnly handed over the Tomos of autocephaly to the Primate of the Local Orthodox Church of Ukraine. The historical event took place within the walls of the Patriarchal Church of St. George in Phanar. The OCU became the 15th Church in the diptych of the Orthodox Churches.